Hotline Miami was a fantastic game that created a perfect marriage of arcade style gameplay with striking pixel visuals and an astounding soundtrack. Needless to say when I discovered the sequel was out I immediately got in the right mood and settled down to what I was sure would be another spell binding game. I thought the plot of the first game was out there and confusing (in the best possible way) but it made a kind of sense. This time around rather than play as two different killers there is a cast of around twelve characters you get to play at one point or another. Set both during and after the events of the first game you play as a whole assortment of odd balls from a corrupt detective to copycat killers, soldiers, mafia and even a journalist who is doing research for a book. Hidden in the cut scenes and actions of the game is a further look at the group responsible for the mysterious phone calls that tell random people to kill, as well as the results of all the death of Hotline Miami. To sum up this really is more of the same to be found here. If you expected a revolution and a change up then you are likely to be disappointed, but if you are after more violence and killing then this is for you. To copy an idea mentioned on the Super Best Friendcast! 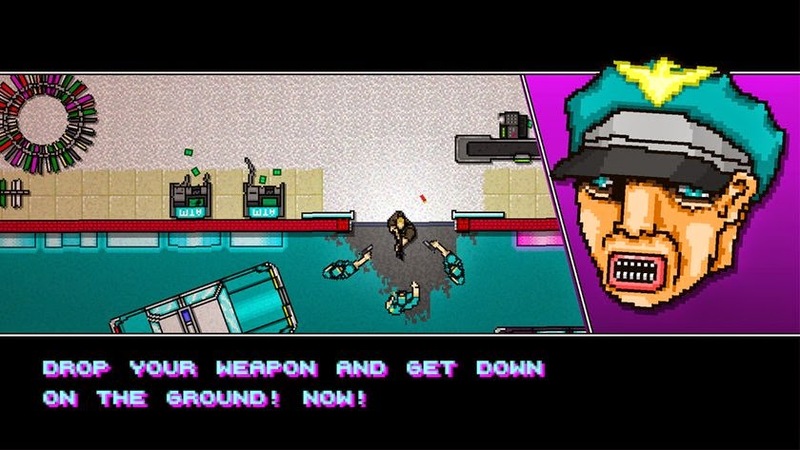 this really gameplay wise is a perfect sequel in that the difficulty of Hotline Miami is added to here, sure there are plenty of easy levels but there are some that are far more difficult and taxing than anything found before. As before each level starts with some interactive story telling providing a reason for the killing. Before you had a variety of masks you could choose to wear, each mask gave you slightly different abilities, with the multiple characters though this device is almost dropped, a few have a small selection of masks to choose from but for the most part each character has specific unique abilities. This restricts the way you can play any given level but at the same time the new abilities feel more special. One character for example is actually two people; twins Alex and Ash. Alex is fully controllable and armed with a chainsaw, while his sister Ash automatically follows behind but has a gun which you are able to shoot. Another character; Evan Wright the journalist doesn't actually kill enemies he fights, instead knocking them out, rather than use guns he actually dismantles any he comes across. So you can see there is more variety in total. The level design has suffered somewhat in that levels are far more sprawling and split into more sections. 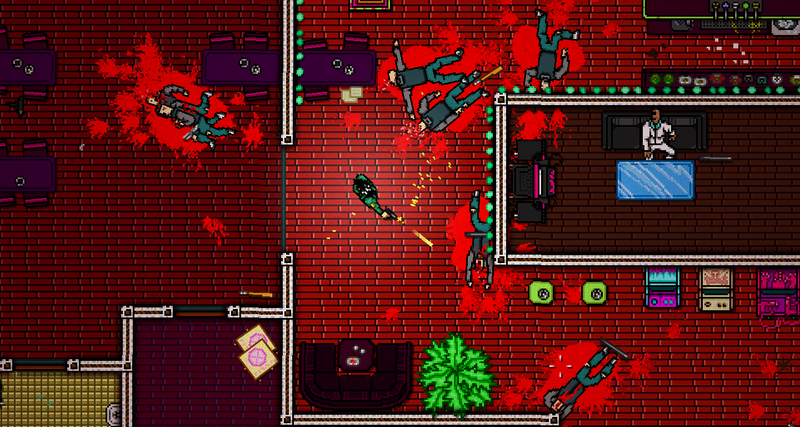 Hotline Miami usually had a two floor rule in that there was literally just two parts to any given level. Here sometimes levels get stretched out into anything up to six or seven sections long which ruins some of the arcade style speed run feeling. Getting completely stuck on a later screen leads to huge frustration as the game wont save unless you completely finish the chapter and so you feel compelled to power on and do the level despite rising anger. There is still the minor problems of armed enemies shooting you from off screen but this is compounded by a lot of open areas where you are getting attacked from all sides rather than the narrow corridors used before. Again a lot of the levels are fun to fight through, especially when the music works. All the music was great before, here when it is good it is really good. One level that sees you blasting through a Police Station Terminator style had one of the best tunes I have ever heard in a videogame, other levels on the other hand have good music but less good than the majority of Hotline Miami. There are the usual gangster hideouts and office type areas but also a few levels set during wartime in Hawaii that have more of a traditional action shooter type look to them. Thankfully there is no awful stealth level this time around and instead you get to do a few dream sequence levels where some crazy things happen, a later one in particular I had to check the Lucozade I was drinking to make sure someone hadn't sneaked into my house and laced it with LSD! From a plot point there is one level in particular that just felt stupid. As the journalist your goal is to get a subway train to someones house, for no reason whatsoever the subway is full of goons you have to fight your way through. This level seemed out of place and judging by the way nothing is made of the station fight it seems it is there just to be something to do which drew me out of the experience somewhat. The A.I is as simple as it always was, enemies if they see you head to your position where you can kill them or be killed. This results in lots of ducking around corners to get the dumb A.I to run towards you. Visually there is far more variation in the enemies you fight, not just restricted to mainly Mafia this time around. Dogs make a return in force, as do bigger enemies who can only be killed by gunfire, and this time around smaller enemies who can only be killed by melee weapons due to them ducking under gunfire. This helps give the game that puzzle aspect it is so well known for. There is lots of blood and violence as usual, especially with some of the more brutal melee weapons that lop off limbs and heads, enemies falling to the floor with intestines hanging out. At one point you get to pull someones head off, spine and all, that was a nice touch. One thing I did notice with the A.I is that occasionally they will get stuck and just spin round on the spot, this mostly occurred when they try and walk through doorways, I don't remember a bug like that before. 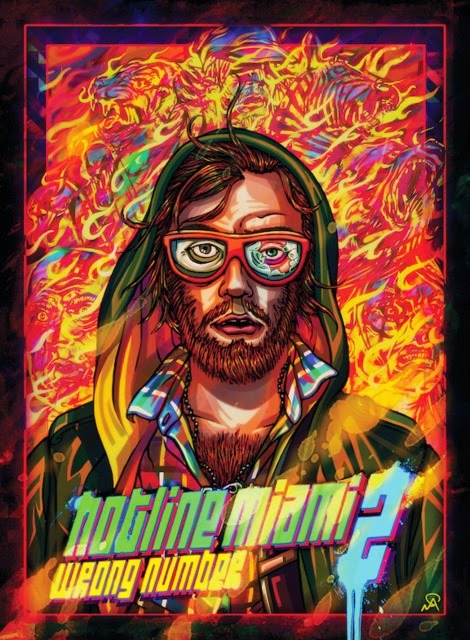 Hotline Miami 2: Wrong Number is a bigger game than it's predecessor with a bunch more levels, but all in all I found the story to be less engaging and the larger level designs meant a lot of the addictive nature (that is still there in spades) has been reduced, especially when frustration sets in. A great follow up game and if you enjoyed it before then you will certainly again here as there is nothing like this to be found anywhere else, especially in terms of visuals and music, but for me Hotline Miami is the better of the two.